Once again it’s been far too long since my last post. I’ve been so busy making things and trying to keep on top of the other things in life that I just haven’t had time to share my makes with you even though I want to do! 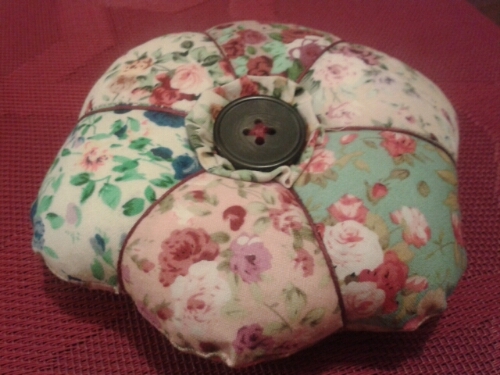 My latest creation is a little pin cushion I’ve made from the ditsy floral fabric pack I told you about a while ago. The photo doesn’t really do it justice as it is so much more vibrant on real life! I’m feeling very inspired by The Great British Sewing Bee on BBC2 at the moment – one day I hope my sewing will be as good as the contestants on the show. 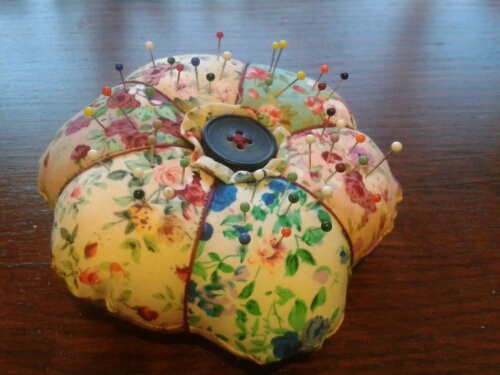 For now, I’m glad that judges May and Patrick will never see my pincushion because if you get really close up you’d see that the stitching doesn’t meet up in the middle of the segments, the curved edges are not very smooth and it’s more tightly stuffed at one side than the other! Instead that’s just between you and me and I’m still rather pleased with it. My first ever piece of patchwork sewing!